Our M18™ REDLITHIUM™ HIGH OUTPUT™ CP3.0 Starter Kit provides you with 50% more power and runs 50% cooler vs our other M18™ REDLITHIUM™ CP battery packs. This increased performance of the lithium-ion battery gives you the same power and runtime of an M18™ REDLITHIUM™ XC battery in a lighter and more compact package. 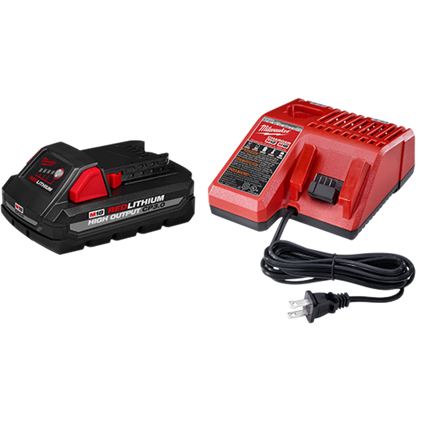 The 18-volt battery pack delivers fade-free power and runs substantially cooler through heavy applications, allowing you to push your cordless power tools throughout a wide range of applications. Our REDLITHIUM™ HIGH OUTPUT™ CP3.0 battery is fully compatible with all 175+ Milwaukee® M18™ solutions. Our M18™ & M12™ Multi-Voltage Charger accepts all of our M18™ and M12™ batteries, so you’ll always be prepared and productive, especially on jobs that require a mix of M12™ and M18™ Milwaukee cordless power tools. The battery charger communicates directly with your battery pack to monitor cell voltage, temperature and charge status to ensure a full charge. As an added level of communication, the charger indicates when the lithium-ion battery reaches an 80% charge, providing you with confidence that your battery can complete a substantial amount of work without waiting for a full charge.